You can find plenty of amazing things to enjoy while visiting Wilderness Lodge Resort, one the Deluxe Resorts near Magic Kingdom Park. Here is a list of some of our favorite amazing things at the Wilderness Lodge that we hope you have the opportunity to appreciate! Have you had the opportunity to visit the Old Faithful Inn in Yellowstone National Park? 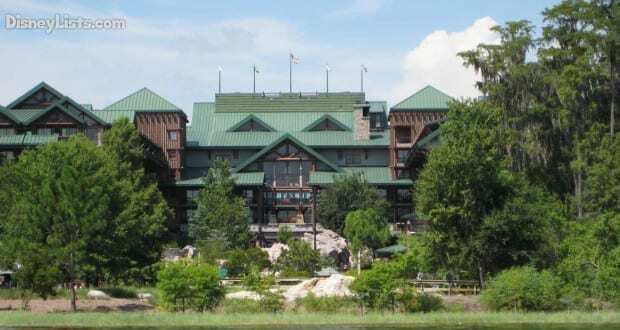 The Wilderness Lodge was modeled after several National Park Resorts, but specifically Old Faithful Inn. The theme perfectly sums up the National Park’s rustic, yet elegant atmosphere. Old Faithful Inn seems to come to life in the Wilderness Lodge with all of the wood, stone, cozy fireplaces, and rocking chairs that plead for you to come put your feet up! Wilderness Lodge has a personal Ranger that offers week day tours through the Lodge. Uncover the incredible details that went into the construction of the lodge and the extensive research that went into selecting the perfect décor. Check with Guest Services upon arrival for days and times the tour is available. This is the perfect rainy day – or resort day activity. 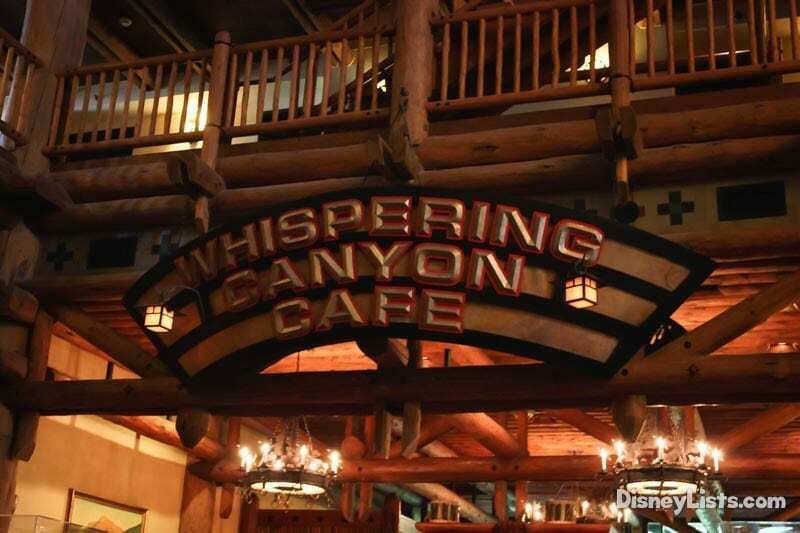 This might be too rowdy for some, but for our family – Whispering Canyon is on our list of dining must-dos. Particularly if you have children, we suggest you make advanced dining reservations for this gem. The exceptional servers set the rowdy tone as if they are long-time family friends. Do you need some ketchup? Get ready for a brigade of bottles to come your way. Plus, Native Americans and Cowboys alike join forces for a wooden stick pony ride! Who doesn’t love looking for Hidden Mickey’s? The Wilderness Lodge is littered with them. You can go exploring on your own or you can check with Guest Services for a Hidden Mickey guide to help you in your search. Check out the two 55-foot high Native American totem poles in the lobby… the one on the left as you enter the resort might just hold a little something you are looking for. That’s right – a geyser! 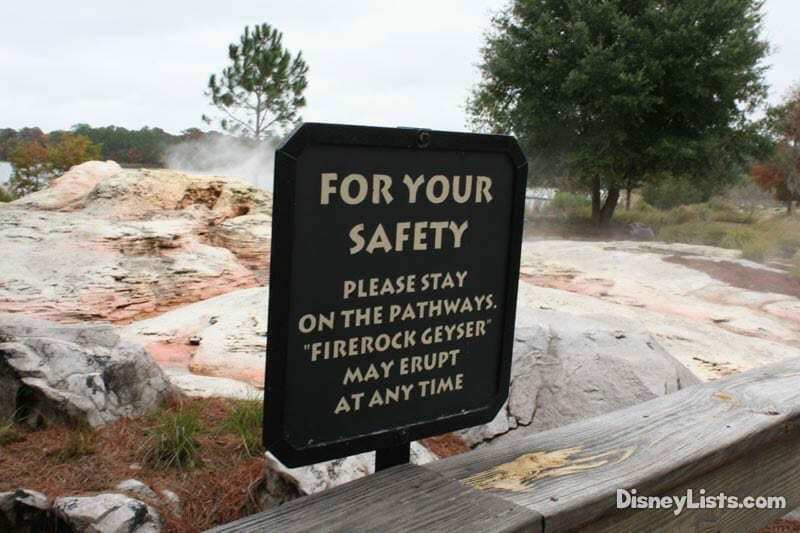 Check out the Fire Rock Geyser at the Wilderness Lodge along the walking path between Silver Creek Springs Pool and the Bay Lake. Every hour this geyser shoots 120-feet in the air starting first thing in the morning until late evening. This is just one example of the great thought and detail Imagineers put into enabling the Lodge transport you away to the National Parks. Calling all railroad memorabilia lovers! Carolwood is well known as keeping Walt’s railroad legacy alive. On display you will see two of the railroad cars Walt Disney owned from his Lilly Belle backyard train. Incredible! Other memorabilia are available for viewing including railroad train car replicas and photos of Walt with his trains. Besides being a fantastic walk through Walt’s love for railroads, this room is known for being extremely peaceful. Need a place to explore while taking in the quiet – head to the Carolwood Pacific Room. The renovations taking place may put a halt on some of the evening activities, but you can still view the Electrical Water Pageant on Bay Lake. You may have seen the Main Street Electrical Parade at Magic Kingdom, but now you can see a similar display of floating lights on the water without leaving the Lodge. Check with Guest Services to be sure you select the right time to catch the parade float by. Get away from all the Disney World hustle and bustle and take fortress in one of the 26 private, waterfront cabins. The path for these cabins begins just past the Boulder Ridge Cove Pool and Geyser Point Bar and Grill. While our tour was of the first cabin along the path, our guide informed us that the privacy just gets even more amazing as you continue down the path. The location is definitely out of the way which makes for an intimate cabin feel. All 26 cabins are identical in design with slight changes in what you can expect to see out the window with wall to wall views once inside of the large lagoon. Once through the front door that trendy, clean, yet rustic décor pops. It’s an instant at home feel where you just want to throw off your shoes and cozy up with loved ones! Besides the water views, the heart of the cabin is the double-sided stone-hearth fireplace. This double-sided fireplace allows guests to stay inside to enjoy the fireplace or take a seat in a rocker outside. The list of amazing things at the Wilderness Lodge really could go on and on. If you have the opportunity to stay at the Lodge, we know you won’t be disappointed. We’d love to hear your favorite things about the Wilderness Lodge!